Raymond Ingelram is a hunter. For much of the two-book series about this British citizen, that is largely all you know about him. In the first adventure, you do not even know his name, first or last. He does not bother to tell anything of his past for the longest time except to admit that he was of the gentry, holding enough money from an inheritance to indulge in his favorite pastime, hunting. It is almost a surprise to Ingelram that he was at all involved with German agents in the days before the Second World War, coming as a result of a spur-of-the-moment decision of his while hunting in Poland. He had hunted game all over the world and the whole of Europe was well-known by him and he was quite comfortable traveling all over it so when the fancy for a different type of target came over him, he felt completely at ease crossing the border into Germany (unnamed for a long time but later admitted). That country he snuck into had a dictator, well loved by that nation but feared and despised by the rest of the continent and Ingelram's inspiration was that the world would be a much better place should he use his shooting skills and eliminate the man. It was only much later that we learn he had a more personal reason than he remembered for wanting the dictator dead. Because the initial action was spontaneous, he did not plan very well his actions before and after but then usually the game being hunted is not in charge of a nation with a cadre of followers protecting him. As a result most of the first adventure is his paying the price for his attempt. The second and final adventure comes a couple of years later when the world was fully involved with war and Ingelram decides another attempt was in order. It also does not go as planned but the experience the man had gained the previous couple of years and the dedication he now possessed to fight the dictator and his minions causes him to take further into a totally different set of troubles. Through the two books, we learn so very little about the man's background and upbringing and life before the affair started. But through the pages we learn a great deal about the man himself. Deciding the world would be better without the Dictator, the experience British hunter makes an attempt on him. He fails and finds the agents of that power are now after him. The only way to survive is to turn from hunted to hunter. When a second attempt on Hitler also fails before it really gets started, Raymond Ingelram decides that his experience as a hunter might come in handy with the Resistance fighting behind enemy lines. Alan Thorndike is an accomplished hunter who decides his next target should be Adolf Hitler. When he fails and is pursued by German agents, he must really call upon his hunting skills. 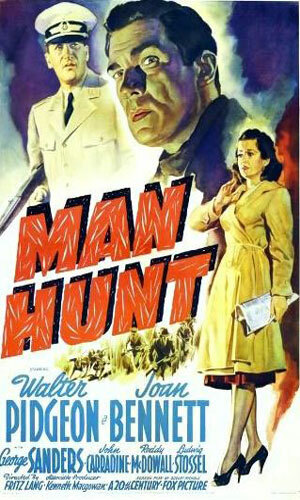 Made for TV movie - Sir Robert Hunter decides in 1939 to assassinate Adolf Hitler but misses. 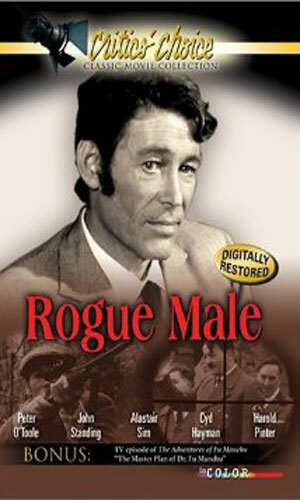 After being caught and tortured, he is escapes back to England pursued by the Gestapo. Knowing his own government would not help him, he is very much on his own. 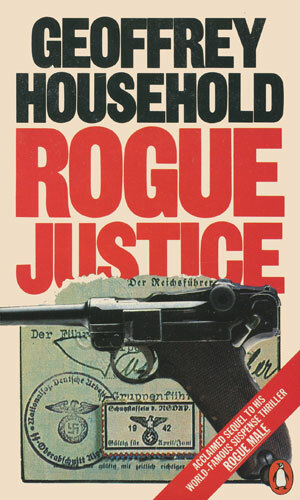 I first encountered Geoffrey Household and his Rogue Male in the early 70s when I was flush with exciting adventures to read from spy authors like Len Deighton and Ian Fleming and Donald Hamilton and Edward S Aarons, not to mention writers of thrillers like Hammond Innes and Desmond Bagley and Alistair MacLean. Someone said if I like them, I would love Geoffrey Household. So I grabbed his best known work and jumped in. My surprise was considerable. It was not at all like those others and at first I was inclined to put it aside for something a bit more modern. Something held me, though, and I was all the better for it. I truly loved the book and the sense of dread from being hunted with no place to hide and no one to help out. And then when the hunted turns to be the hunted, I was forever mesmerized. The author decided four decades later to continue the story, this time letting us in on the man's name (though the two movies made of the first book each gave a different name). I did not learn of the second book until the mid 90's and did not read it for another few years. It did not hold me anywhere as close as the first but it was still good and worth the time. Raymond Ingelram is no where near being a spy but since I also write about those involved in international intrigue and such and trying to kill the most hated world leader in the past century definitely qualifies. I loved the first book and liked the second. I also felt there was no need for a third. 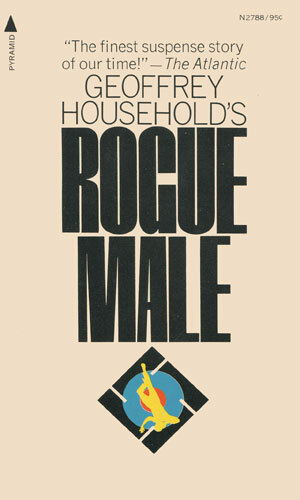 The grade is for the pair since the first deserved an A and the second a B.
I''ve only read Rogue Male, but eagerly want to read the ''follow up'', especially as the plot sounds more to my liking too.